Light It Up Blue for autism in Cyprus. 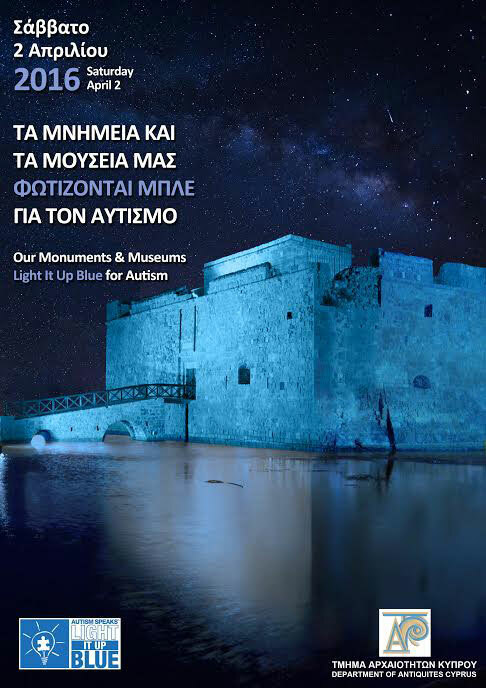 On the 2nd of April 2015 the Department of Antiquities of Cyprus will take part in the international event entitled Light it Up Blue, organised to celebrate the International Autism Awareness Day. For the purposes of this event, the Medieval Castles of Pafos, Lemessos, Kolossi, and Larnaka, the Medieval Manor House at Kouklia, and the Archaeological Sites of Choirokoitia and Amathous, will be lit blue. Blue will also be the colour of the lighting of the Cyprus Museum, and the Archaeological Museums of the Limassol and Larnaka Districts. The participation in this international endeavor to raise public awareness on the characteristics and difficulties faced by persons in the Autism spectrum, and their families, coincides with the vision and mission of the Department of Antiquities to create a solid framework for social development, based on archaeological and cultural values. With this action, the Department of Antiquities underlines in a tangible manner that the protection and promotion of our archaeological heritage are not independent of their social context, but comprise actions aiming at all citizens and the growth of contemporary culture.